← This Week’s Hubble Image: Black Hole Revealed! Here is a reprint of a review I wrote about SJA1 Wildspace. Before I start with the review, a word of warning: SJA1 Wildspace, like many (but not all) TSR adventure modules, was sold with a poster. Once this module comes out of its original srinkwrap, it is very easy for it to get separated from the poster. Not all sellers are D&D experts, so some of them don’t even realise they are selling incomplete D&D products. Check the seller’s description to make sure they have the poster that came with this adventure. If a seller does not specifically mention the poster, I suggest you contact them before handing over any cash. The poster is numbered 9273XXXX0701 and has the text “The Skyrunner” and “The Hive” on it. SJA1 Wildspace is an adventure module for the Spelljammer Campaign Setting using 2nd Edition Advanced Dungeons and Dragons rules. You will need Spelljammer AD&D Adventures in Space (the boxed set containing the Spelljammer Campaign Setting) to tell you how wildspace and spelljamming is supposed to work in the game. Other Spelljammer products may also be helpful, especially if you want to continue the adventures in space after the end of this story. If you don’t have all of these books, you may be able to get some limited use out of SJA1 Wildspace. The adventure starts on a normal “groundling” world, so it would be possible to use it as a one-shot trip into space, and bring the adventure back to the ground at the end of the story. This would allow you to work the adventure into any other D&D campaign setting…or any non-D&D campaign setting. The same applies to the rules. While designed for 2nd edition D&D, it could be converted to other versions of D&D or even different fantasy RPG systems. 1st edition AD&D is fairly similar to 2nd edition, so that should be fairly easy to use. 3rd edition D&D is less similar, but fans have made conversions of some of the older D&D material and if you hunt around the Interwebs, you will find that much of the work is done for you. The 64 page adventure book. The cover has a fold out section at the back, with monster stats and has three pages of information about The Hive’s Mural’s. The poster has deck plans for The Skyrunner and maps of The Hive. The adventure booklet has everything else. SJA1 Wildspace is designed to work for four to six players of levels 6 to 8. The adventure features a world destroying menace, called The Ravager, and a spacefaring captain called Jon Tobart, who wants to recruit the player characters into joining the crew of his ship, The Skyrunner and helping him attack it. But something is not quite right with Jon Tobart’s mission, and by the time The Skyrunner reaches the rogue asteroid called The Hive, where The Ravager operates from, the players will realise that they have got into something a lot larger than they thought they had. The Hive is actually a large hollowed out asteroid (billed as “the biggest dungeon”). It’s chambers are large enough to have their own miniature environments. It turns out to be the lair of a long dead clan of beholders, and The Ravager is some sort of unfinished beholder super-weapon, hidden somewhere within it. A living clan of beholders have discovered the existence of The Hive. And for their own reasons, they are attempting to get to Jon Tobart before his ship gets to it. And when they arrive, Jon Talbart’s secret is revealed and the player have to enter The Hive on their own. Can they find and destroy The Ravager, before it leaves The Hive and destroys their world? Or will one of the many threats inside The Hive defeat them? Designed to take players from any groundling world, this adventure can take players from any D&D gameworld into the Spelljammer Campaign Setting. One of the endings allows this adventure to be run as a one-shot space adventure, that brings the PCs back to their world. Excellent backstory on two beholder clans, adds to the detail on one of Spelljammer’s iconic monsters. Three new monsters (including the first example of a beholder mage). Hints about the Arcane – another iconic Spelljammer monster race. If its momentum could be stopped, The Hive could be reused as a new celestial body within the crystal sphere the adventure takes place in. Some of the races within The Hive are “kidnapped” from elsewhere (either the homesphere of the Sazaur nation or a sphere close to it) and the adventure could inspire a search for their homeworld. Aimed specifically at groundlings, the adventure setup would require some reworking to use in a campaign already set in Wildspace. 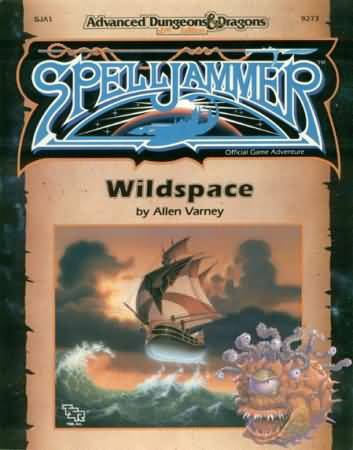 Like many Spelljammer products, Wildspace is generic and designed to fit into the GM’s campaign. But this means the GM will need to design their own crystal sphere (using the rules from the AD&D Adventures in Space boxed set) or grab one from another Spelljammer product, if they want to go beyond the adventure in this book. This adventure does not feed directly into SJA2 Skull & Crossbows. If you wish to use both adventure, you need to plan a way to get The Skyrunner from the crystal sphere you set SJA1 Wildspace in to the sphere that you set The Rock of Bral in. If the players really screw up, The Ravager will destroy their homeworld, causing problems if the GM wants to run an ongoing campaign on that world. The positives far outweigh the negatives. I think you would get the best out of this book if you bought a few other Spelljammer products and planned a good place in the universe to set SJA1 Wildspace before starting the game.